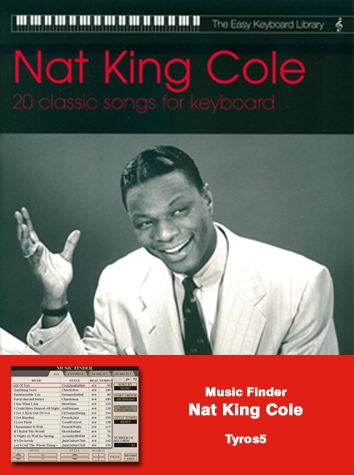 This pocket-money Music Finder file contains Music Finder titles and One Touch Settings settings for the 20 songs in the popular keyboard music album 'Easy Keyboard Library - Nat King Cole' (available from many good music retailers). '(I Love You) For Sentimental Reasons', 'Answer Me, My Love', 'Around The World', 'Because You're Mine', 'A Blossom Fell', 'The Christmas Song (Chestnuts Roasting On An Open Fire)', 'Darling Je Vous Aime Beaucoup', 'If I May', 'It's Only A Paper Moon', 'Let There Be Love', 'Makin' Whoopee', 'Mother Nature And Father Time', 'Nature Boy', 'Orange Coloured Sky', 'Send For Me', 'Smile', ‘Somewhere Along The Way', 'Too Young To Go Steady', 'Unforgettable', 'When I Fall In Love'. The Music Finder file - ‘EKL_NatKingCole’ should be copied to a USB stick.